Everyone loves exoplanets. And luckily for us (everyone), astronomers have discovered thousands of new alien worlds in the last decade using data from the Kepler mission. Two campaigns (9 and 11) of the extended Kepler mission, dubbed K2, set sights on the galactic bulge. Today’s authors supplement data from these K2 campaigns with VVV survey data, an ongoing mission to survey the galactic bulge in near-infrared wavelengths, in order to hunt for exoplanets. 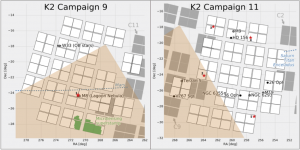 Figure 1: The K2 campaign fields used in this paper. The tan-colored region marks where the VVV survey overlaps with the K2 fields. The red stars represent the location of the five candidate exoplanets. 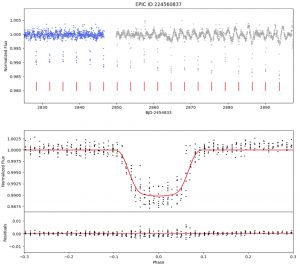 The authors analyze just shy of 900 light curves from K2 for their exoplanetary treasure hunt. Specifically, they are interested in transiting exoplanets, which are easy to detect from light curves alone. Light curves show how the light we receive from a star changes over time — if a significant dimming occurs periodically, it could be a sign that an exoplanet is passing in front of its host star, blocking a portion of the star’s light from reaching us. The next step is to analyze the aforementioned light curves for periodic signals. The authors fit the signals they find, discard bad photometry, and use any available VVV survey data to throw out false positives like nearby stars, which can disrupt the light curve (VVV has a much higher resolution than K2, making it easy to double check for contaminants not resolved in the K2 images). From their analysis, they find five real-life transits that likely belong to exoplanets. Figure 2: Flattened light curve (top) of exoplanet candidate 22456087 (#2 in table below). Blue and gray points indicate data from the two parts of K2 campaign 11. Red lines mark transit times. The bottom panel shows the phase folded normalized light curve and residuals, with the best fit model shown in red. As far as host stars go, the authors use Gaia DR2 data to roughly estimate stellar parameters like temperature and radius (and interestingly enough, all the hosts seem to be K/M type stars). They find that one of their host stars is probably a giant, another is a variable TTauri, and the rest are just regular dwarfs. Which is cool, and doesn’t really change much, so now onto the planets. In order to find out more about their planetary candidates, the authors model the transits using several Python programs (BATMAN, emcee, and Forecaster, for those interested). From these models they can estimate the exoplanet’s radius, since the transit allows them to obtain an approximate planetary to stellar radius ratio ( ). From this estimated radius they can then get a mass-radius relationship, which isn’t terribly accurate, but provides a starting point. This allows the authors to roughly say what type of planets they’re looking at. Figure 3: Table of planetary parameters. Exoplanet 1 in the table above orbits around the TTauri star we mentioned earlier. It is the largest planet in this bunch, and also the sketchiest. It seems to be a warm jupiter based on its period, but may very well be a stellar object, since it’s estimated mass is so large. The same scenario applies to exoplanet 2 which appears to be a hot jupiter (yes, there is a difference) but again, could be a stellar object. However, the authors claim that exoplanets 1 & 2 passed all the false positive tests, so the likelihood of planet-hood is still high. Exoplanets 3 and 4 are the smallest of the bunch, and it is safe to say that these are low-mass planets, which are defined as having a mass of less than 0.3 Jupiter masses. For reference, Earth weighs in at 0.003 Jupiter masses, so there’s no discrimination here. We’re low mass too. Exoplanet 5 is also likely to be a hot Jupiter based on its period, but the radius and mass estimation could not be performed, as Gaia DR2 data for the host star is poorly constrained. Fortunately though, the ratio is still relatively reliable. If the host is a giant star like the authors believe it to be (based on its far distance and relative brightness), then the radius ratio indicates that this planet is likely a gas giant. So there you have it, this completes your rundown of the latest entries to be added into the compendium of known exoplanets. Of course, follow-up observations of these potential planets, namely spectroscopy, are needed to confirm their existence and physical properties. Stay tuned to see if these five candidates make the final cut.